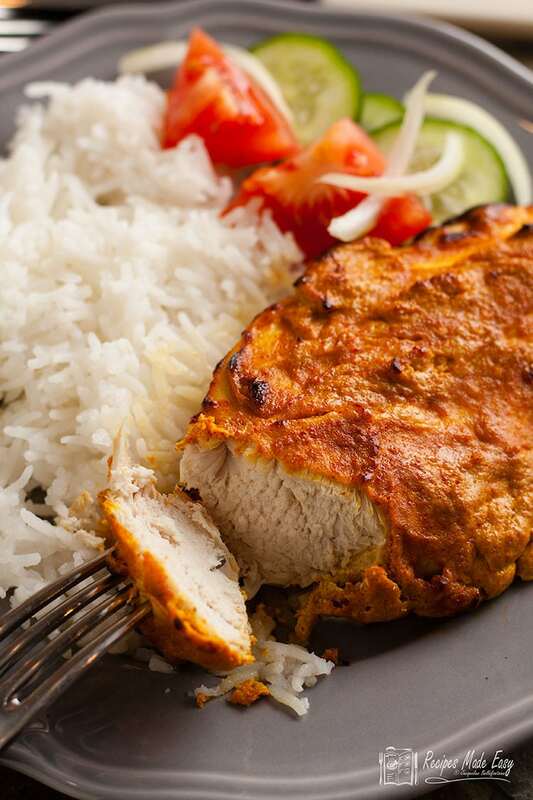 This easy oven baked chicken tandoori recipe is packed with flavour. A Classic Indian dish that makes a healthy alternative to a curry. 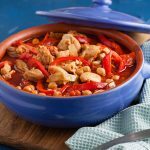 Delicious served with rice or naan bread and a side salad. 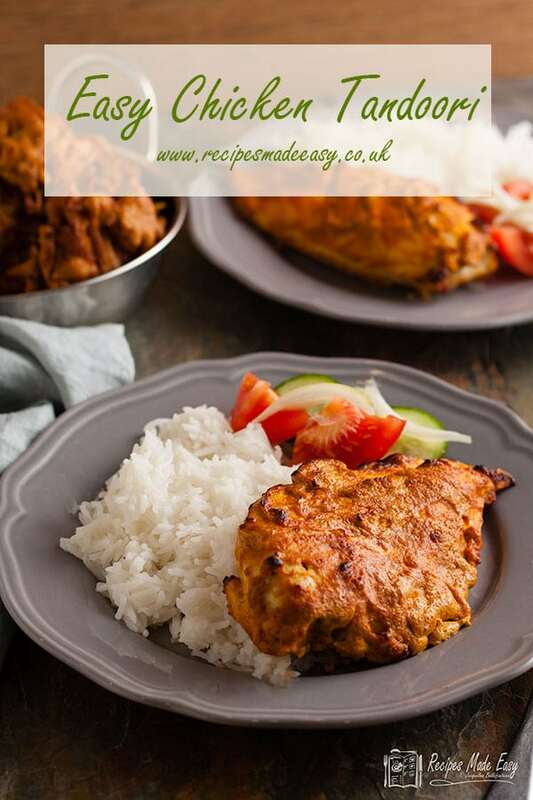 I make no claims to the authenticity of this recipe but it is a dish we enjoy at home that has a similar flavour to a chicken tandoori take away. 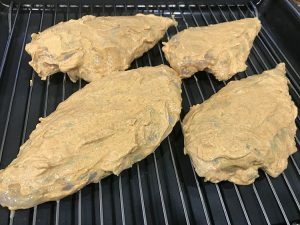 To begin with, to be a true chicken Tandoori it would need to be cooked in a Tandoor a cylindrical clay oven in which the dish is traditionally cooked and takes its name. 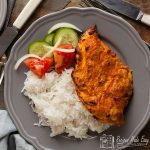 My easy tandoori chicken recipe is simple to make at home, baked in an oven and using spices which are readily available in the supermarket, so no need to hunt down an Indian grocery store to make this dish. Its also low fat and low in calories making it a healthy mid-week meal choice. How long do you marinate Chicken Tandoori? The raw chicken is marinated in yogurt flavoured with spices. 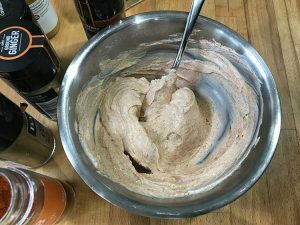 I like to use a really thick Greek yogurt for this so you get a generous layer of the marinade on the chicken which in turn changes to a “crust” when you cook it. I would recommend that you marinate the chicken for at least 1-2 hours. Ideally, marinate the chicken for between 10 and 12 hours and up to 24 hours is fine. The marinated chicken is then cooked in a hot oven. In the summer we cook it on the barbecue which gives it a more authentic flavour as it starts to get some of the smoky flavours that a wood-fired tandoor would give it. You can serve Tandoori chicken as a starter or a main course. 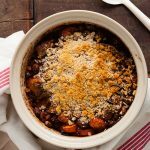 It’s delicious with naan bread or rice and a side salad. I also like to serve it with my really easy yogurt sauce. Sometimes we also serve Onion Bhajis along side or as a starter (recipe coming soon). 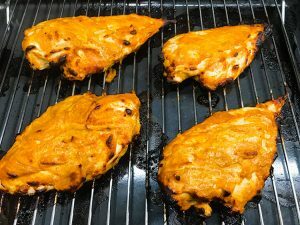 I’ve used chicken breasts to make this easy chicken tandoori but you could also use chicken drumsticks or thighs. 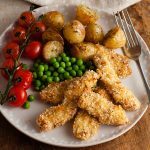 Alternatively, use chicken breasts or thigh fillets and cut into chunks. Thread onto skewers to cook. 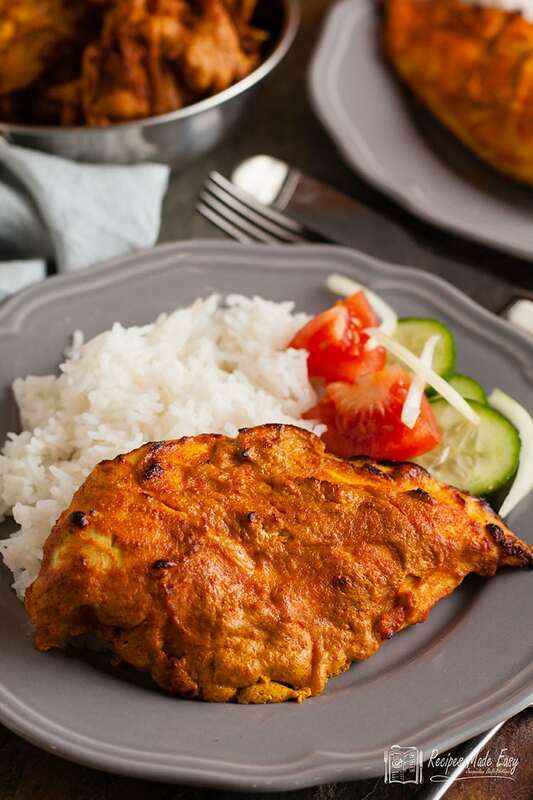 Tandoori chicken can also be used as a base for numerous curries such as butter chicken. Use a thermometer to check the centre of the chicken has reached the correct temperature. Chicken breast can dry out if overcooked. 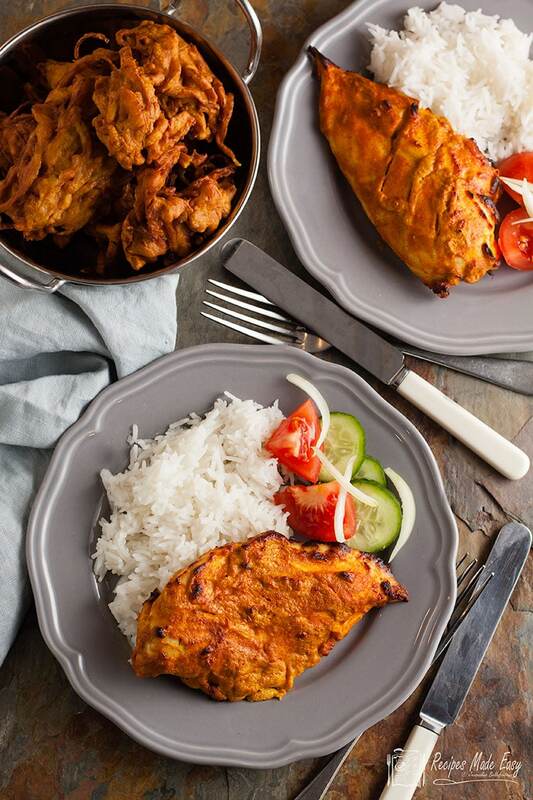 Quick and easy to prepare Chicken Tandoori tastes amazing but the flavour is further increased if it is left to marinate for several hours. 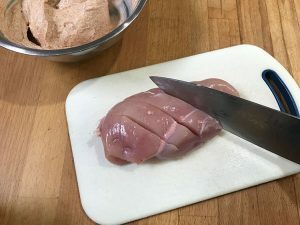 Cut two or three slashes into each chicken breast and place in a shallow dish. Add the marinade and turn the chicken over so that they are well coated in the marinade. Allow to marinate for at least 2 hours or overnight if possible. Preheat the oven to 200C/400F/gas mark 6. Place the chicken on a trivet placed over a roasting dish. Bake for 20 to 25 minutes or until the centre of the chicken reaches 75℃ (167°F) or the juices run clear when pierced with a knife. Garnish with coriander. 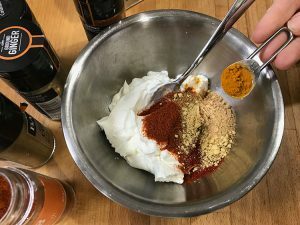 Place the yogurt in a bowl and add the spices. Add the marinade to the chicken and turn until well coated. 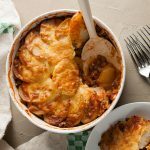 DO YOU LIKE RECIPES MADE EASY? 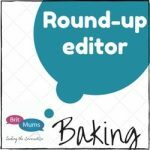 Why not subscribe to Recipes Made Easy for my weekly newsletter. 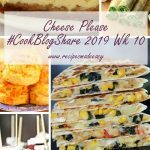 Or follow me on Instagram, Twitter and Facebook to never miss a recipe. This looks so delicious. I’d eat it in a flatbread with salad. I wonder if I could use Quorn fillets? Sounds tasty! Could I use fat free yoghurt? I have not tried with quorn fillets so I’m not sure about those. 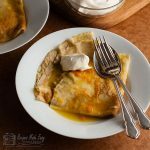 You could use a fat free yogurt if you wanted but the recipe is pretty low fat anyway and i find thicker yogurt clings more and produces a better crust.